You know how sometimes unfortunately situations are very funny; this is what I am sharing here today. One of my friends was telling me how he was locked out outside of his apartment the other day. It was late at night and he was wearing his short shorts and t-shirt. He decided to go and throw the rubbish out down the chute. So grabbed the keys from the back of the door and went to throw the rubbish. His rubbish chute is only 10 steps away. On his way back, when he tried to open the apartment, he realised that the key he had picked up was the ones for his work not the ones for his home. It was late at night and he didn’t know what to do. He was not really dressed to go out of the building but he didn’t have any choice. His sister had a spare key but he didn’t have his phone on him. So, he had to go out to the corner shop in his short shorts. Luckily, the woman behind the counter didn’t see him walk in but saw him once he was at the counter and could see his top half only. He had to request to her to use her phone so he could call his sister so she could let him in with the spare keys. She was kind enough to let him make the call. He joking with us that if the lady had seen him in only his short shorts, she might have called police instead. After that he had to wait outside the apartment building and wait for his sister. It took her another 30 minutes to get there and finally he was inside. I am sure that was very unfortunate for him but he was laughing when he told it us. It reminded me of the time when AS locked us out. It was a hot summer day and we were getting ready to go to swim in the pool. So, I was in my bikinis and he was wearing his swimming shorts. I had towels and as we walked out from the apartment, I asked AS if he had the key, as I wasn’t carrying my keys. He tapped his shorts’ pocket and said yes he did. I told him to take the key out just to check but he said it was OK so we went to pool area. As it is a security building, we need a key to get in the pool and the AS realised that he had picked up our gym key instead of the apartment key. Lucky for us, my brother and SIL were to join us for a swim so they were there and had a phone with them. We called the locksmith and waited 45 minutes outside the apartment in our swimmers for him to show up. Finally, he did and opened the place within minutes but it cost us $120. Nowadays we both laugh every time if I ask AS to make sure he got the house key. 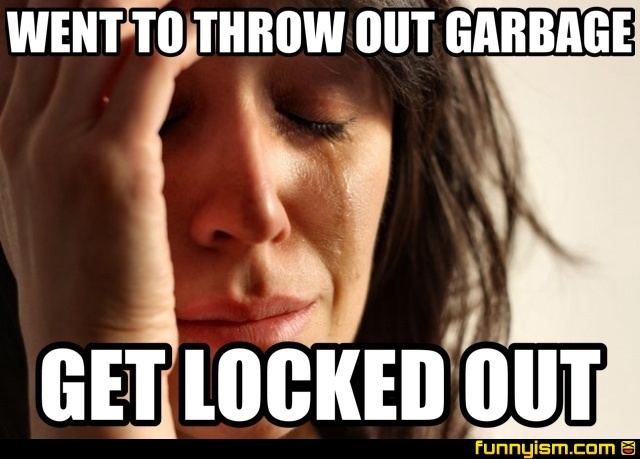 Please share your locked out story or anything similar. This entry was posted in Personal and tagged apartment building, hot summer day, keeys inside, lock out, lock out from home, locksmith, Nepaliaustralian, rubbish chute, short shorts, spare key, spare keys. Bookmark the permalink. With the attire you have described one would have loved to be locked in not out! 🙂 During our courtship I used to lock the gate from outside to keep unwanted privacy intruders at bay! And now we always keep a spare key with our relative near by for any such emergencies. I am sure about that. I have never given keys to anyone, may be should think about it as a back up. It happens. In my case, probably too often. Wow, they are all such incredible stories and all got saved thankfully. i got locked out of my car on a really snowy day at a gas station 25-30 miles from my place. No locksmith was willing to come because of the snow. I wanted to cry alone and it was getting dark. I had a spare key at work and my friend at work was luckily just getting ready to leave and she drove all the way there in the snow to hand me the keys. That incident still gives me chills, one of the most terrible day but I was home safely. Ohoo poor you. Glad your friend was able to help you . You ran 12Kms, OMG u must be very fit. I forgot my car keys. I was going home from work and discovered the keys were not in my purse but in the car. I had to call my Dad. he was so annoyed coz it was 10 PM and 30 minutes away from home. He said what a waste of gas ! ohoo, that is hard. Glad at least your dad come to your rescue.